If you thought it was just consumer-oriented computers like the Eee PC, MSI Wind and ECS G10IL that were getting the new Intel Atom processor, think again. CNET Asia found a Classmate PC hanging out that the Intel Atom booth at Computex. 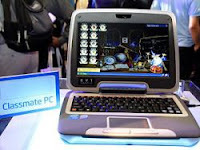 The Classmate PC is built using an Intel reference design, and is basically Intel’s answer to the OLPC XO Laptop. The machine is primarily targeted at educational markets and developing nations. The model on display at Computex was manufactured by ECS, the sole Taianese manufacturer, although other companies in other countries will likely introduce the same product with different names. In the US, CTL sells the Classmate directly to consumers under the CTL 2go PC name with a starting price of $399. Currently the CTL 2go PC ships with a 900MHz Intel Celeron CPU, but hopefully we’ll see a version using the power-saving Atom CPU soon.